FRANKLIN, Mass. 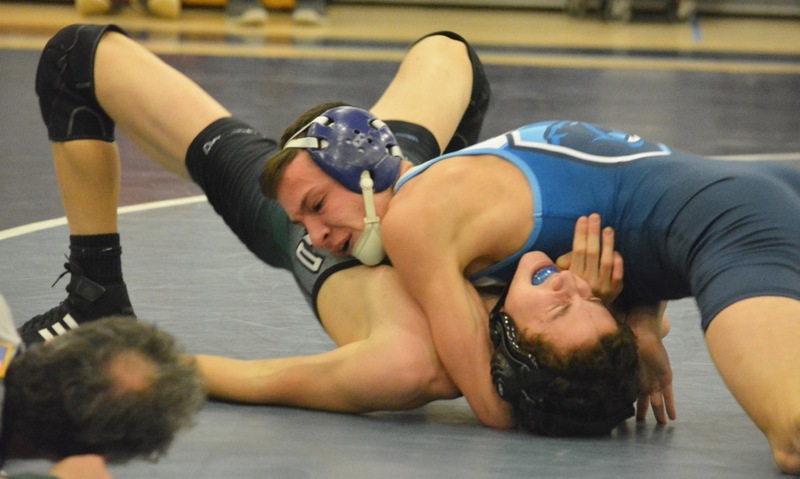 – In the end, Franklin walked away with a comfortable 22-point win and at least a share of the its second straight Kelley-Rex division dual meet title, but this was anything but an easy Wednesday night on the mat for the perennial Hockomock League power. Mansfield came into the gym with a ton of energy, looking to clinch its first league title and avenge last year’s big loss in the Albertini Gym. The Hornets battled from the start, but the experience of the still undefeated Panthers proved to be too much, as they sealed a 43-21 victory. Jake Carlucci got the meet off to a great start for the Panthers with a pin at 106 pounds and a quick six points. Franklin would get pins in three of the first four matches, but it was not straightforward for the Panthers. Mansfield cut the lead in half with a 6-0 win by Antonios Savastos at 113 and Andy Triantifilopolous came storming out to take control of the action at 120 against Ian Bakalars. The Franklin wrestler turned things around in the second (after a brief injury break for the Hornets grappler) and ended up with a hard-fought pin in the third round. After Jordan Carlucci earned a first round pin at 126, Franklin led 18-3. One of the turning points in the meet came at 132 where Will Stratton fell behind 5-0 after two rounds to T.J. Remillard, but flipped the match on its head in the third and nearly had the Panther pinned. The referee’s hand never hit the mat, Remillard broke free, and pulled out a 7-5 win. C.J. Glaropolous picked up six points for the Hornets with a second round pin at 138, but the momentum was short-lived as Mike Racca got the six points right back with a first round pin at 145. Mansfield started to climb back into the match with a 9-5 win by George Glaropolous at 152 pounds and then a second round pin by Jayden Curley that cut the lead down to nine. The Hornets were seconds away from cutting the deficit to just six with Aidan Archambeault holding onto a one-point lead inside the final 10 seconds of his match at 170, but Thomas Smith got a last-second takedown to win 5-4. Vinnie Holmes kept hopes alive for Mansfield with a 10-4 win at 182, but Bruce Johnson sealed the victory and another league title with a 10-2 victory at 195. With the added fourth point from Johnson’s win, Franklin led 34-21 with just two matches remaining. Jack Coughlin won 7-0 and Riley Dowling had a second round pin to add gloss to the final score of what was an otherwise close meet. Franklin (18-0, 3-0) and Mansfield (17-4, 3-1) will both compete in the Hockomock Championships at Canton High on Saturday.